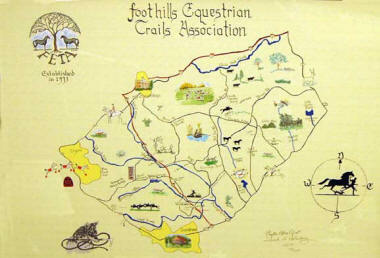 Purchase this beautiful map of the FETA Trails and help FENCE at the same time! Handcrafted by local artists Sarah Holmberg and Phyllis Eifert, this limited edition map of the trails shows local landmarks and waterways, and can be customized with the addition of your own farm's location. Even better, $50 of your purchase price will be donated to the stewardship fund for the conservation easement protecting all of FENCE's property, including riding trails. Available framed or unframed. Order your map by email or by calling 828-894-0496.